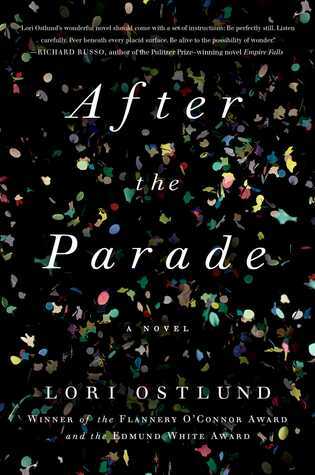 Ultimately, Flannery O’Connor Award-winner Lori Ostlund’s debut novel, After the Parade, is about abandonment. It’s about other things, too. Finding a place for yourself in the world. Understanding where you’ve been in order to see where you’re going. Learning to take a chance on other people. One thing it’s not about is being gay, at least not in any extraordinary way. The novel’s protagonist, Aaron, is a gay man, and there are several other gay characters, as well as some overt coming-out-of-the-closet symbolism, but this book, appropriately, takes Aaron’s homosexuality for granted. (At one point, Aaron even uses his homosexuality as a defense against a bully who suspects his girlfriend of cheating on him, turning the gay-bashing cliché on its head.) And it never becomes the sort of coming out, coming-of-age tale that is, at this point, a bit too familiar. But the flip-side of abandonment is declaring your independence, and the novel is also about that. As Aaron looks at it, “It was all a matter of perspective: whether one was focused on leaving or arriving, on the past or the future.” In the end, it’s all about putting the past behind you and getting on with your life. On his own for the first time, Aaron moves into a shabby apartment in San Francisco and lands a job teaching English as a Second Language. His students are all struggling in various ways, most with their own traumatic histories, and Aaron’s past still haunts him, preventing him from achieving his goal of breaking free. When he meets a private investigator who offers to find his mother, Aaron is reluctant at first, but eventually realizes that he’ll never be truly free if he doesn’t achieve some closure. And so, with the information the P.I. turns up, off he goes on his quest to discover why she left all those years ago. Many novels race forward in time with a thrilling plot and little or no exploration of character motivations or psyche. This is not one of those novels. There isn’t a lot of action or forward momentum to speak of in the present time of the book, and after he leaves Walter, other than teaching his students, Aaron doesn’t actually do much, which some readers may find frustrating. Instead, Ostlund is mostly interested in why her characters do what they do. Why did Aaron’s mother leave? Why does Aaron connect with Walter in the first place, and why does he later leave him? Why is Aaron drawn to Walter’s sister, Winnie, as if she were his own sister. To answer these questions, Ostlund makes frequent digressions from the narrative’s present time into flashbacks that peel away the layers of Aaron’s childhood— the period before his father’s sudden death, the years when his mother ran a small-town diner, the time after she disappeared, and the years with Walter. And the question for the reader is what will Aaron do once he learns the truth? Will he be paralyzed by it? Or will it set him free? It’s an excellent question, and also an excellent reason to read the book.